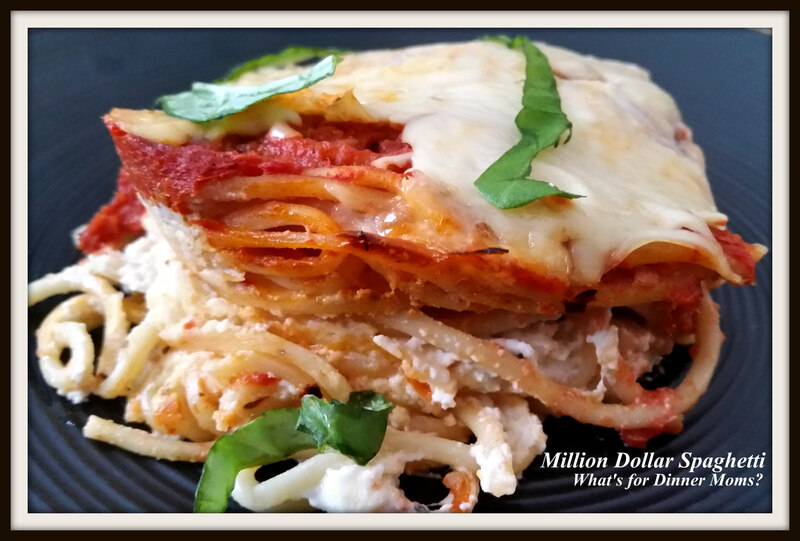 Million Dollar Spaghetti – What's for Dinner Moms? This recipe has been all over Pinterest and Facebook for years. I have always resisted trying it or making a twist on it because it is so popular. I am an old-fashioned, easy, home cook. I am not about the popular. Although, I have wanted an Insta Pot to try but we are not quite there yet. My slow cooker and bread maker are good enough for now. But, I finally broke down after spending almost a week inside looking at cooking videos, Pinterest, and cookbooks. Staying inside during cold winter days makes me want to make homemade bread and casseroles or stews every day! So, I am trying a no buy January – have to pay off those Christmas bills, and need to use what I have on hand. So, Million Dollar Spaghetti it is. This is also a great dish if you need to have something ready to cook for dinner the next night and don’t feel you have time to put it together. It can be wrapped in plastic wrap and refrigerated overnight before cooking. Just remove the plastic wrap, cover with aluminum foil and bake as usual. My daughter is trying to get away from eating too much meat. The original recipes I saw for this dish called for either Italian Sausage or ground beef to be added to the sauce. We decided to do a nice flavorful non-meat sauce for our dish. I used 6 cloves of garlic in making the sauce. It had a bright fresh flavor and made the dish a bit lighter. This is a hearty heavy dish. My son described it as lasagna without the flat noodles. He is correct. So, you can make this however heavy or light as you want. You can substitute cottage cheese for ricotta. Not my thing, but some prefer the dish that way. You can use different noodles and different sauces. Mix it up, have fun! I served this with a green side salad and a loaf of crusty hot bread for cleaning up any cheese and sauce left behind on the plate. Cook spaghetti to al dente according to package directions. Once spaghetti is cooked and drained return it to the pan and add 3 cups of sauce. Mix well to coat. In a bowl beat together the ricotta, cream cheese, dried basil, onion powder, and garlic powder until creamy. Stir in 1 cup of mozzarella cheese to the mixture. Spread 1/2 of the spaghetti in the bottom of the casserole dish. Spread the cream cheese mixture over the spaghetti. Cover with the rest of the coated spaghetti. Spread 3 cups of spaghetti sauce over the pasta. 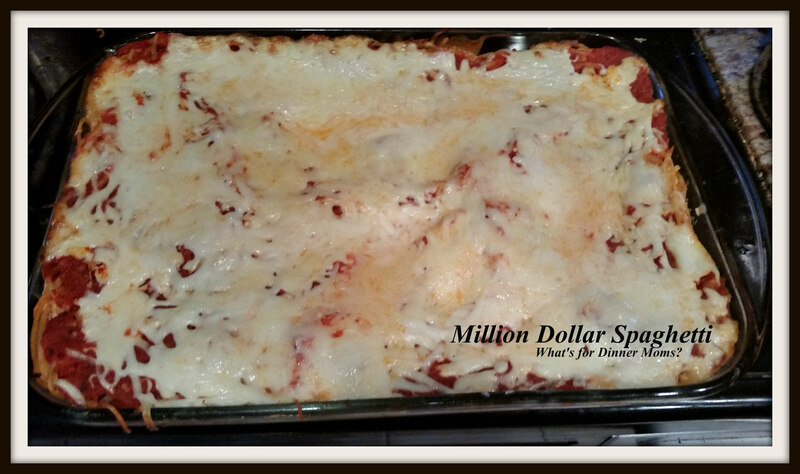 Top with remaining 2 cups of mozzarella cheese. Cover with aluminum foil and bake for 30 minutes. Remove aluminum foil and bake for an additional 15-20 minutes until top is browning and is bubbly. Remove from oven and allow to sit for at least 5 -7 minutes before cutting. Served topped with freshly grated Parmesan cheese and fresh basil as desired. Your son is right definitely looks like lasagne! I love spaghetti! This looks so good. I was thinking it looked like lasagne before reading the post. Now you know I HAVE to go look that up! Maybe in our future! Thank you! I would love that! Thank you so much! Cannot wait for a time to try it! Oh goodness! Put it in the search and you will see hundreds of videos and pins on it! Thanks for stopping by! Looks like a great winter time meal as well! I had a cooking blog for a year and it was fun. I think I will post some authentic recipes once in a while. That sounds nice. I would definitely love to see them and hear the stories with them. The weather’s been making me want to cook too, and keep our apartment warm using the oven! I’ll have to try making this, it sounds like a good meal for a cold night. Thank you! We thought it was a nice comforting dish. I haven’t heard of that dish yet but it sounds great! I need to cook in advance mostly. Is it possible prepare it the evening before and to bake the last 15 to 20 minutes before serving at lunchtime the next day? Yes! I would add a bit of extra sauce to the dish and cover with aluminum foil and plastic wrap. Remove those before baking. It may need a few extra minutes if baked directly from the fridge. Fantastic!! I will check it out. Thank you, Marci! We both have that in common! I am an old fashioned home cook and the basics are best as far as I am concerned. This looks good! Thank you! Others do not understand that. I put myself out as a Home cook here is what I make. I AM NOT a chef.